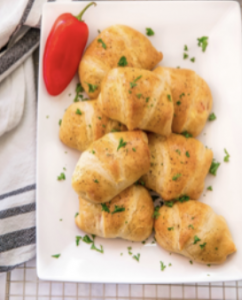 Make a quick, hearty, grab-and-go breakfast with delicious Egg Sausage Breakfast Crescent Rolls. Filled with egg, sausage, cheese, and peppers – these are a family favorite, for sure! Cube sausage links into small slices (I do this using kitchen shears). 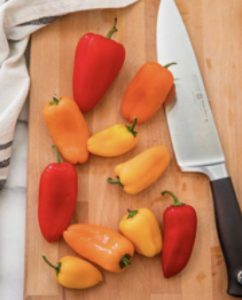 Chop the red pepper into small pieces. In a bowl, whisk the eggs, lightly salt and pepper, mix again. Spray a skillet with nonstick cooking spray and heat over medium to high heat. Add the sausage and pepper, sauté, breaking up sausage with a spatula and cook until sausage is no longer pink. Pour eggs into the pan with the sausage and pepper. Scramble eggs until fully cooked. Remove from heat. Add the cheese to the eggs and mix. Roll out crescents and add a generous portion of filling. Close edges of the crescent, roll up, pinch edges closed. Place crescent rolls on a baking sheet. Brush tops and sides with beaten egg and sprinkle cracked black pepper on top. Bake and 15-18 minutes, until golden.